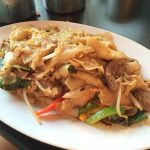 The origin of the name, Drunken Noodles, is not quite clear. Some say it's a dish to be eaten as a hangover cure and others say it means that you should drink when eating this dish. Which ever it is, they forgot to mention how delicious it is.....a little spicy but the lime leaves or zest and basil cleanse and refresh the palate.Note: You can change the number of people served by placing your cursor over "Servings". In a mortar, add crushed garlic, crushed chiles and minced shallots and blend into a paste. Over high heat add oil in wok or deep skillet, add the paste and red onion and stir fry till onion is limp. Add the chicken breast and stir fry till half cooked then add broccoli and continue stir-frying for about 2 minutes. Stir in the sauces, lime leaves, sugar and add the noodles and toss well and noodles are well heated. Sprinkle with basil, mix well and serve. You can order Kaffir leaves from Amazon but if you don't want to do that, you can use lime zest from common Persian or Mexican Key limes (6 leaves = 1 tbsp zest). You can also substitute other citrus leaves, such as lemon or lime.